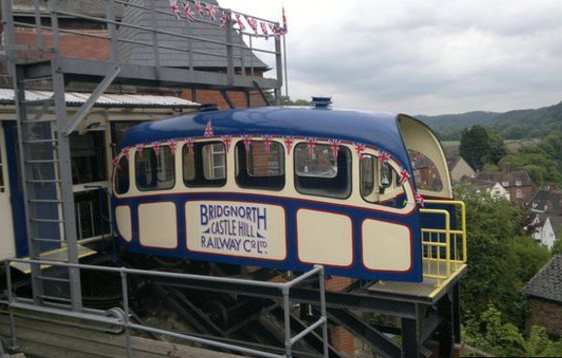 Britain's only inland cliff railway, opened in 1889, 60 m. long and to a guage of 1.06 m.
The Castle Hill Railway at Bridgnorth differs slightly from the majority of UK cliff railways inasmuch as it is situated inland, rather than by the coast. Originally the townsfolk had to negotiate some two hundred steps to get from the 'high town' to the 'low town', so a proposal was put forward in the late 19th century to construct a funicular railway. Voiced by George Newnes, MP and the eminent engineer, George Croydon Marks, the concept was simple - a railway to link the two communities. The Bridgnorth Castle Hill Railway Company Ltd was duly registered, and work commenced on the line in November 1891. 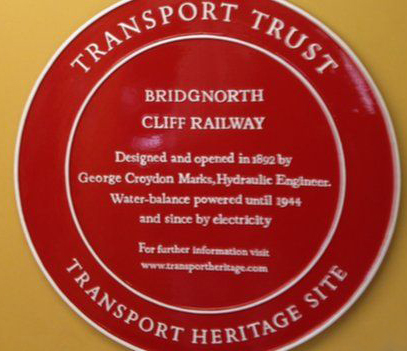 The proposal was for a twin track railway, running at an incline of 1 to 1.81 over a distance of some 200ft (60m), but in order to achieve this a cutting had to be created in the cliff face, getting progressively deeper as it ran down the cliff. Two problems were encountered. Firstly, great care had to be taken to ensure that dwellings at the foot of the cliff were not damaged and, secondly, the discovery of caverns within the cliff meant that the track-bed required additional support. George Law of Kidderminster carried out the track construction work, using a 3ft 6 (1.06m) inch gauge. This was the widest that could be accommodated in the cramped space available at the foot of the cliff. The cars were of box type construction, mounted on a triangular sub-frame containing a 2,000 gallon water tank to facilitate the operation of the water balance principle. When a car was located at the upper station, its water tank would be filled from a storage tank in the station building, sufficiently increasing the weight of that car to be heavier than its lower counterpart. As two winding cables joined both cars, when the brakes were released on the upper car for it to descend, the lower car would be pulled up by it. On reaching the bottom, the water would be drained from the car's water tank and two 'Otto' gas pumps would return it to the upper station storage tank for the whole process to start again. Messrs Bradney & Company were responsible for the station buildings, but both are quite different. The upper station is considerably larger and very ornate, with its 'gothic' spire complementing the brick and timber framework. In contrast, the lower station appears dark and cramped, tucked away down a small alley off the main road. Ironically, it was the lower station that provided most of the facilities, including a restaurant, a waiting room, and toilets. At the opening of the Castle Hill Railway on 7th July 1892, the formalities were performed by the Mayor of Bridgnorth amid great celebrations. Services continued uninterrupted for the next 41 years, when the unexpected decision to close it was taken by the Bridgnorth Castle Hill Railway Company in April 1933. Naturally, this was a very unpopular decision and, following much debate, the railway was purchased by Alderman Myatt, with the line re-opening in May 1934. By 1944 the water balance equipment had reached the end of its natural life, and the line was duly converted to electric winding. 1955 saw the replacement of the car bodies, although the sub-frames were retained, and in 1996 ownership passed from the Myatt family to Mr & Mrs Reynolds. They have continued to maintain the service and improve facilities. Today the railway survives as a proud legacy to Victorian skill and ingenuity. No visit to this historic town would be complete without a ride on the wonderful Castle Hill Railway, which not only affords commanding views of the surrounding countryside from its upper station, but remains one of the most impressive railways of its kind in operation. By Road: The Upper station is on a turning to the left off the southern end of the High Street. The lower station is on the B 4363 close to the bridge over the river Severn.